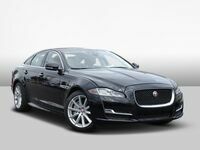 Do you live in Bexar County TX and desire the best that Jaguar has to offer for its sport sedan lineup? 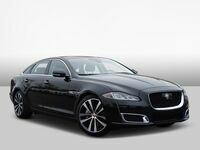 If so, then you'll want to check out the 2017 Jaguar XJ at Barrett Jaguar! 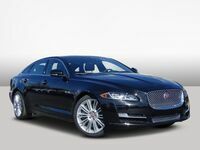 Boasting high-powered engine options, a comfortable and refined interior, exquisite English craftsmanship and cutting-edge technology, the XJ is ready for any of your driving adventures in South Central Texas. Schedule a test drive and come experience this sporty and luxurious sedan for yourself! Are you ready for an exhilarating driving experience? 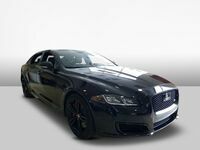 Engine choices in the 2017 XJ include a 340-hp 3.0L Supercharged V6, 470-hp 5.0L Supercharged V8 and the top of the line 550-hp 5.0L Supercharged V8, which produces a top speed of up to 174 mph and accelerates from a standstill to 60 mph in just 4.4 seconds. The 8-speed transmission in the XJ is controlled by the beautifully designed JaguarDrive Selector, which rises into your hand once the Start/Stop button is pressed. JaguarDrive Control offers specific settings for the drivetrain: Dynamic Mode, which modifies transmission shift points while illuminating the Virtual Instruments in red, or Rain/Ice/Snow Mode, providing more progressive throttle control for slippery conditions. It's easy to get drawn into the beautifully designed exterior of the 2017 XJ, which features a fusion of honed lines and sculpted elegance — embodying Jaguar's aim for a dramatic, dynamic and pure design. The front of the car is bold and assertive with an imposing front grille design, which is framed by powerful full LED headlights, boasting a striking illuminated "double J" daytime signature light design. The rear windshield wraps seamlessly around the vehicle to create a floating roofline that emphasizes the long, low and wide profile, while striking taillights with running lights and elliptical tailpipes accentuate the power and agility of the XJ. Step inside the 2017 XJ and enjoy its luxuriously appointed interior, where the quality of craftsmanship throughout the cabin sets it apart with a wide choice of colors, materials and finishes. The view from inside the XJ is exceptional: a panoramic, heat-reflective glass roof sweeps back and over the rear seats. The feeling of luxury is punctuated by exciting comfort elements, and phosphor blue lighting creates an elegant finishing touch. Also, the XJ is equipped with a wide array of standard and optional InControl and driver assistance systems to make driving easier and more convenient. Every XJ is fitted with Jaguar InControl Touch Pro as standard — the fastest and most advanced infotainment system ever from Jaguar. Whether you’re a luxury sedan shopper in Boerne, Schertz, New Braunfels, San Antonio or anywhere else in Bexar County, we're confident you'll be very impressed with the 2017 XJ. Feel free to contact us at Barrett Jaguar to learn more!